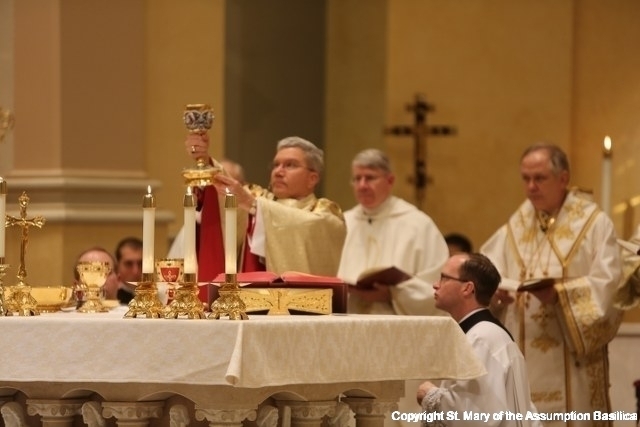 The Holy Mass is the highest point of our life as Catholics! It is through the sacraments, especially the Eucharist, that the Lord breathes life into the Church and fashions the Church and each Christian more fully into the image of Jesus Christ. By virtue of baptism in Christ, every Catholic is called to participate in the Mass in a “full, conscious and active” way, as demanded by the Second Vatican Council (Constitution on the Sacred Liturgy, #14). Does that mean that everyone should take on a ministry in the Mass? No! Pope John Paul II clarified this when he said: “Active participation certainly means that, in gesture, word, song and service, all the members of the community take part in an act of worship, which is anything but inert or passive. Yet active participation does not preclude the active passivity of silence, stillness and listening: indeed, it demands it.” (Ad Limina Address to Bishops of the United States, 1998). By attentively listening, singing, saying the responses, and entering into prayerful silence each of us does, in fact, fulfill the mandate of the Second Vatican Council. But some of the faithful are also called upon to fulfill various liturgical roles and so assist the entire assembly in entering more fully into the mysteries being celebrated. “The faithful, moreover, should not refuse to serve the People of God gladly whenever they are asked to perform some particular ministry or function in the celebration” (General Instruction of the Roman Missal, #97). We are blessed as a parish by those who generously give of their time by serving the parish through various liturgical roles in the Mass – Extraordinary Ministers of Holy Communion, Lectors, Ushers, Altar Servers, Musicians, etc.